If you know anyone battling ovarian cancer or cervical cancer, then you know that they are going through a difficult fight. Give them hope and the strength to keep fighting when you give them this beautiful awareness necklace with a teal ribbon on it. They can wear it daily and gather hope from it. This Pendent is a silver-plated square frame that features a 1” Crystal insert. It's printed with our Teal Ribbon butterfly Design. The Crystal Pendent hangs from a silver-plated Ball Chain Necklace, measuring 23” long. Free personalization of any name is included. 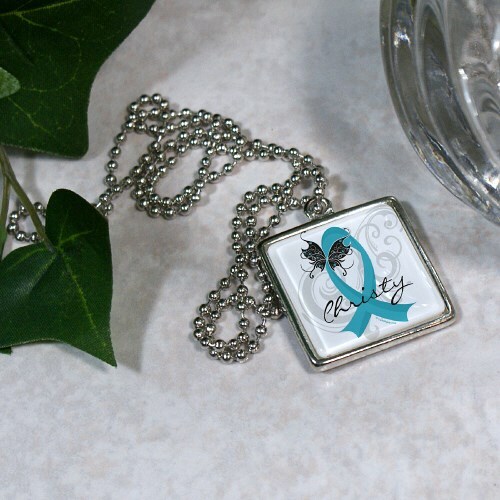 Additional Info The teal ribbon pendant will serve as a symbol of strength for anyone who wants to spread ovarian cancer or cervical cancer awareness. Our Awareness Pins are also very popular.